I've mentioned before and will say it again, snazzing up everyday things is awesome. (just like 'snazzing' is a word) If you look at something every day or use an item all the time, no matter how ordinary it is, you could do something about it. 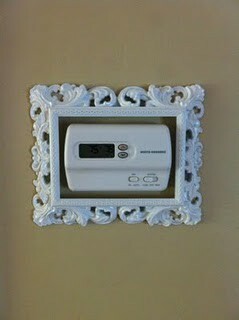 A thermostat? Framed? Very unexpected. Wouldn't this put a smile on your face, even on a day when it's so cold you need to turn up the heat? This just opens a whole new thought process for me. Prettifying everyday items. This would be a simple DIY too. Go to the thrift store, yard sale or flea market, buy a few old frames (spray paint them, this is optional) and frame something unexpected at home. So clever! What would you frame?